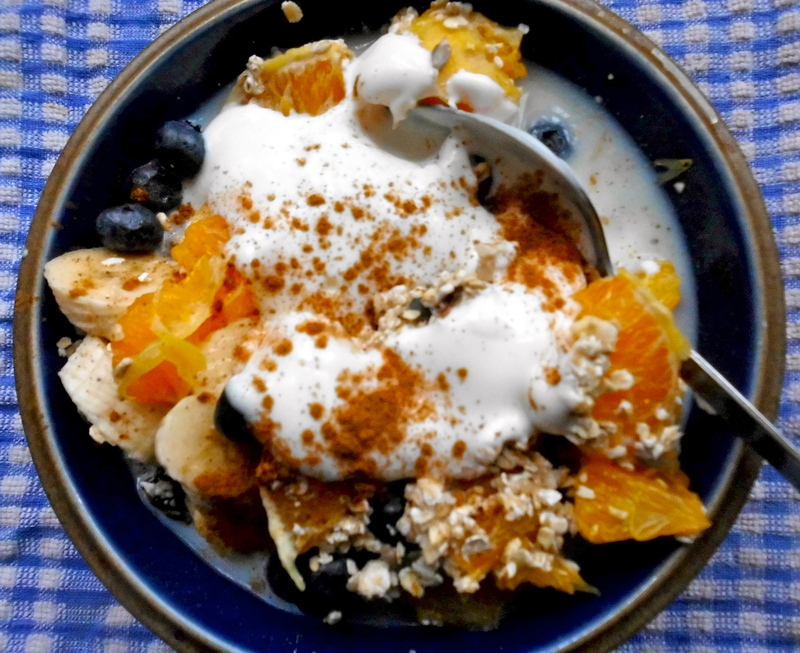 This recipe for wholesome and nutritious muesli is literally what you decide it to be! Individually you – by you, for you! Put all the ingredients in a large mixing bowl and mix. Serve a portion in a cereal bowl with either milk or very low fat natural yoghurt – or the two combined. Dawn: This recipe is so very simple and so very easy to do. I’ve quite literally taken some dried fruits, seeds and my most favourite always-in-the cupboard nuts – brazil nuts – and mixed them together. Bob’s your uncle! They make the most delicious muesli for breakfast and give a massive energy boost to help keep you going all the way through until lunchtime. Originally devised around about 1900 by a Swiss physician, Maximilian Bircher-Benner for his hospital patients who needed diets rich in fresh fruit and vegetables and was inspired by “a strange dish” he and his wife had experienced while on a hike in the Swiss Alps. Nowadays, it is commonly recognised that we all need diets rich in fruit and vegetables to contribute to our overall healthy living and wellbeing. Bircher originally soaked oats with water and lemon juice overnight and then served it with yoghurt. Something I think I’m simply going to have to try! I’ll report back on what I think. You can use any dried fruits: cranberries, currants, sultanas, etc. with any seeds and nuts you happen to have in at home. Fresh fruit can, for example, include grapes, grated apple, mango, strawberries, raspberries and can be served with fromage frais, quark and other dairy products as well as adding ground nuts such as ground almonds and a dash of your favourite spice such as cinnamon or ginger to create a muesli completely unique to you – you’re only limited by your own imagination! I’m rather partial to serving this delicious muesli with a sliced banana, a roughly chopped orange and a smattering of fresh blueberries with a couple of heaped tablespoons of very low fat natural yoghurt on top, then lashings of cool milk and topped off with sprinklings of ground cinnamon. It’s currently my most favourite breakfast! And definitely counts towards my having my 5 A Day! So go on – Make It Your Own Muesli! It can be anything you want it to be! Another nutritious breakfast using oats is porridge and you can find the recipe here from my “How To Make” series – “How To Make Porridge”. Another nutritious breakfast using oats is porridge and you can find the recipe here from my “How To Make” series – “How To Make Porridge“.